To say that artistic practice has shifted significantly since the turn of the 21st century is a monumental understatement. Although outdoor monuments continue to be produced under the rubric of public art, the gallery is becoming as much a site of research as it is a site for display. A recent example of the emergent research-creation exhibition can be found in Montreal-based artist Karen Tam’s project based on artist Lee Nam, an early-20th-century Chinese immigrant to British Columbia and a friend and colleague of the painter Emily Carr. From what began as a set of exhibitions and residencies at the Mendel Art Gallery (2014) and the Art Gallery of Greater Victoria (2017), Tam has developed an installation that reimagines Nam’s painting studio in Victoria’s Chinatown. For the RAG iteration, Tam has focused her archival research on Nam’s infl uence on Carr’s more fl uid mid-1930s paintings. 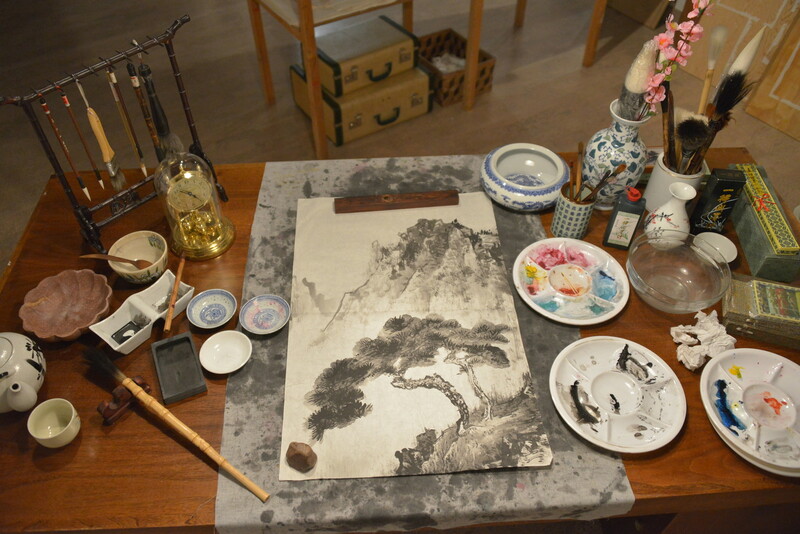 At the same time, she offers Nam’s studio as a platform to connect lineages and kinships among Chinese, Hong Kongese, Taiwanese and Canadian ink brush practitioners. In a dialogical gesture, Tam invited into Nam’s studio the work of others, including 20th-century Chinese ink brush artists Qi Baishi and Yu Fei’an; Victoria- and Montreal-based artists Lui Luk Chun and Tam’s own mother; and local contemporary ink brush artists from across Richmond and the Lower Mainland. Accompanying the exhibition is an extensive publication produced in partnership with the AGGV and the Varley Art Gallery that details Tam’s in-depth historical research methodology, her material fi ndings and her aesthetic responses to the artworks reproduced within.